Do try it if you find them! They taste a little bit like popcorn if you accidentallyonpurpose char them a bit. Just for posterity I’ll note that the meal pictured, though not exactly expertly photographed, was very satisfying. It was also entirely low carb, except for the wine. Obviously. Smoky Spicy yogurt marinated chicken kebabs, paprika is always welcome. 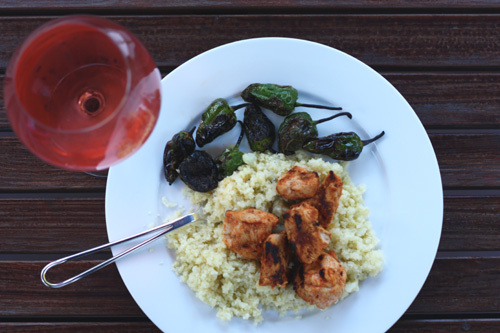 Cauliflower Rice, or as we were referring to it during this meal: Cauliflower Cous Cous. I was first introduced to these at the Spanish Table (market for all things from Spain) in Berkeley. I bought a bag, sauteed them up and was hooked from that moment on. They add so much fun to a tapas party! I’ve since seen them at Berkeley Bowl and the Farmer’s Market in the SF Ferry Building. I also found seeds on Amazon and grew my own last year. This year they even had seedlings at Whole Foods. This is something new to me, definitely wanna try it.. Thanks a lot..
Sprizee – I thought they might be super special too but I’ve gotten them on my last two trips to my (very small) PCC market. Report on how the oven roasting goes, I bet it’ll be great. Lisa – Oooh, I have never been tempted to grow peppers until now. I have a plan for next summer, thanks! Good idea Lisa! These are totally going in my garden next year. You’ve read my mind. 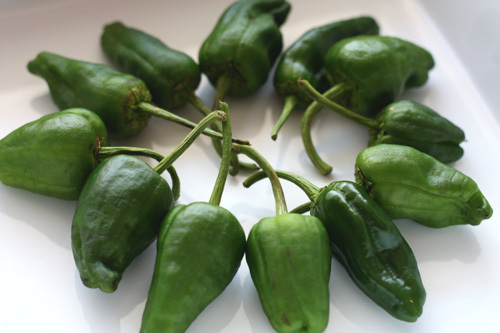 We’ve got Padron and Shishito peppers growing in the yard this year. We tried to plant mildest to hottest and the first ones off the plant threw us off. haha I totally know what you mean about every 5th one being hot. Happened to me recently with what I thought would be an innocent cubanelle pepper + hummus snack. Eek! Great idea to grill/fry them.